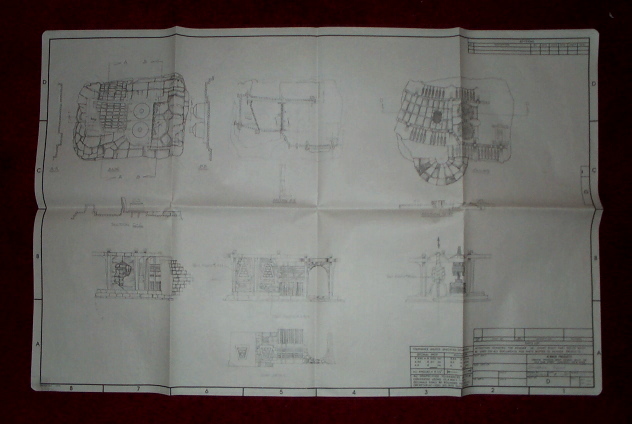 This is a series of blueprints and hand-drawn sketches on velum for the Unproduced Micro Collection Jabba Boiler Room playset. This playset was considered as an extension to the Micro Collection line in the early 1980's to include new settings from the upcoming film, Return of the Jedi. The line was cancelled before this product could hit the shelves. 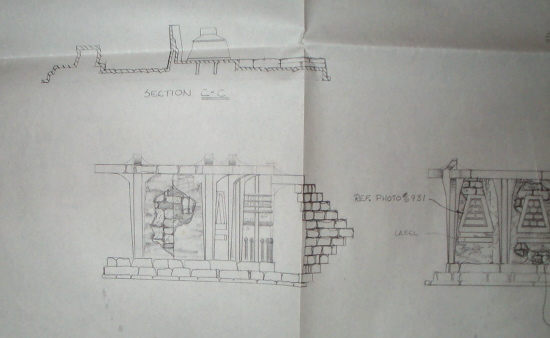 The drawing above is an original pencil sketch of the entire Jabba Boiler Room playset. This fabulous drawing shows all angles of the playset with precise measurements of every section to serve as a guide for sculpting the production toy. The specifications in the lower right hand corner note this playset as the "Dungeon Room". 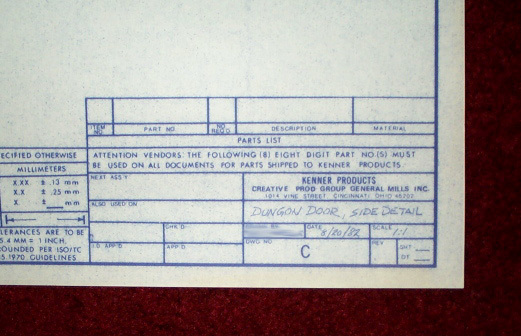 It is clearly marked as a Kenner Products design drawing with the signature fo the designer. 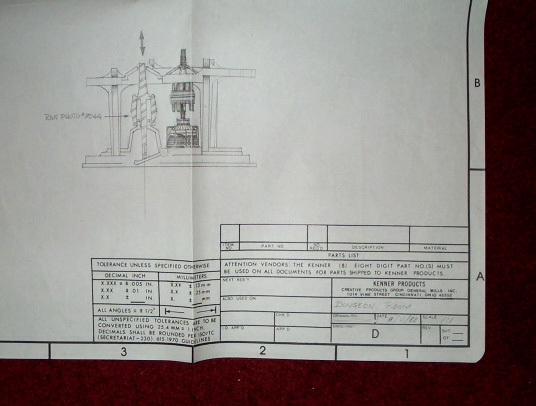 Above the specification box, there is a detailed sketch of the generator mechanism for the playset. 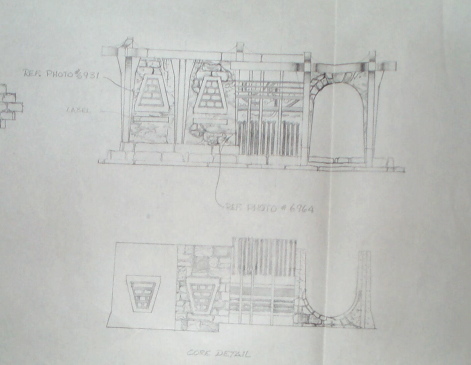 These two drawings show the flip sides of one of the faces of the playset, the section with the trapezoid-shaped windows (noticed on screen in the scene where an alien grabs C-3P0 out the window with his tentacle). The sketch shows a detailed brick pattern on both sides of the facade. 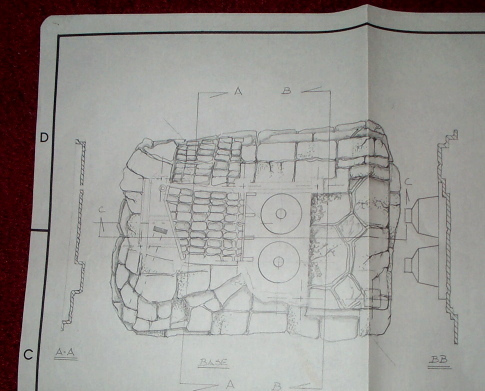 There's also a detailed pencil drawing of the top view of the playset. Towards the bottom is the spiral staircase that appears to never have been molded for early stages of the toy. The top section shows the secret hatch and the top view of the generator mechanism. This image shows the side view of the playset with another glimpse of the spiral staircase and an interesting brick pattern bursting out of the wall. These drawings are detailed enough to create a PLA prototype or sculpt an exact replica of the playset with parts that conform. 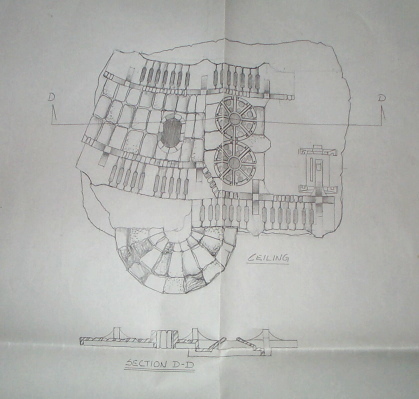 This sketch shows the top view of the playset bottom when the top section is removed from the floor. The sketch shows intricate detail of the brick pattern in the floor. 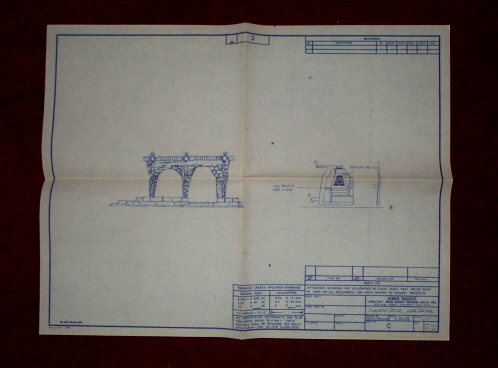 This is a blueprint of the dungeon door piece to the playset. 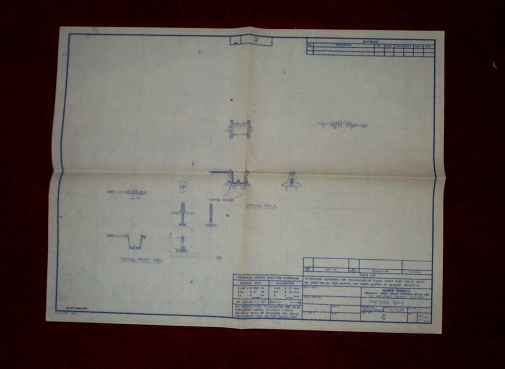 Along with the other original sketches it shows a detailed brick pattern. A closeup of the blueprint data calls this out as "Dungeon Door, Side Detail" for this separate piece to the playset. 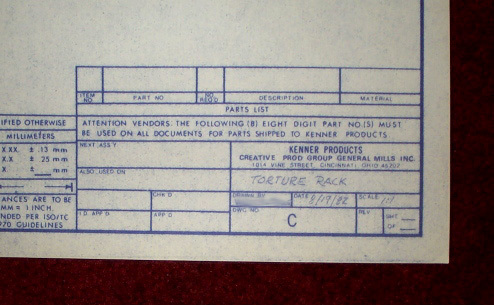 This blueprint is for the torture rack where the Power Droid (commonly known as the lovable "Gonk") is slammed with a branding iron by torture droid, 8-D8.